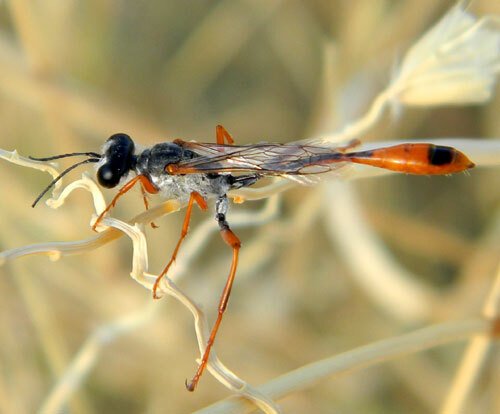 Arizona Naturalists >>> Sonoran Desert Naturalist >>> Field Guide >>> Insects, Spiders, Centepedes and Scorpions >>> Ants, Bees & Wasps >>> Ammophila sp. This wasp was observed resting upon a perennial grass, (Big Galeta -- Pleuraphis rigida) in the Rainbow Valley, Maricopa Co., Arizona, USA. May 2010. Nearctica.com lists 115 North American species in the genus. Thread-waisted Wasps are predators of plant-feeding caterpillars. But the caterpillars they catch are not consumed by the adults - instead they are stung into paralysis and then stored in an earthen chamber. The wasp then lays her egg in the chamber, an egg that will hatch into a worm-like grub that will feast on the larder of caterpillars, pupate and later emerge as an adult wasp. For energy and food adult wasps mostly take nectar from flowers. This is yet another insect that vegetable gardeners should recognize and protect because they help control pests biologically without pesticide use. The biology and behavior of these fascinating wasps are described in detail in the classic, 'must read' nature book, Wasp Farm By Howard Ensign Evans (1963).